Located at the cusp of the Middle East, Turkey is known for combining the best of both worlds. Along with a beautiful and diverse landscape, its unique geographical position makes it a frequent party in international trade in both the Middle East and Europe. Indeed, every year thousands of foreign companies from around the world manage their business affairs in Turkey, whether to export their products, manage existing subsidiaries, or merge and partner with Turkish corporations. These business dealings naturally involve a number of corporate documents that need to be used in Turkey, and many of these documents come from Canadian companies. Unfortunately, using your Canadian documents in Turkey is not as simple as just sending them there. In order for them to be recognized by the appropriate authorities in Turkey, they must go through a process of validation. Turkey is one of many countries which has signed the Hague apostille convention and therefore uses the apostille process of verifying documents. It is likely you have been advised to get a Canadian apostille for Turkey. However, Canada is not a signatory to the Hague apostille convention so there is no such thing as a Canadian apostille. Instead, Canada uses the original two-step process that these countries used before the convention: authentication and legalization. This is the process your Canadian documents will have to go through to be valid for use overseas and it is equivalent or equal to an apostille. Authentication and legalization involves verifying the signature on any given document. This signature cannot simply belong to anyone; it must come from a certified authority such as a Canadian lawyer, notary public, select members of the RCMP, and signatories at the various provincial vital statistics offices across Canada. One of these signatures is required on your documents in order to be valid for authentication at Global Affairs Canada, who also have some additional requirements before they can authenticate your Canadian documents. This step can take up to 20 business days to complete for documents they receive by mail or courier. Note this does not include shipping time to and from Global Affairs Canada. Once authentication has been completed, your documents are ready for legalization at the consular section of the embassy of the country in which you need to use your documents. 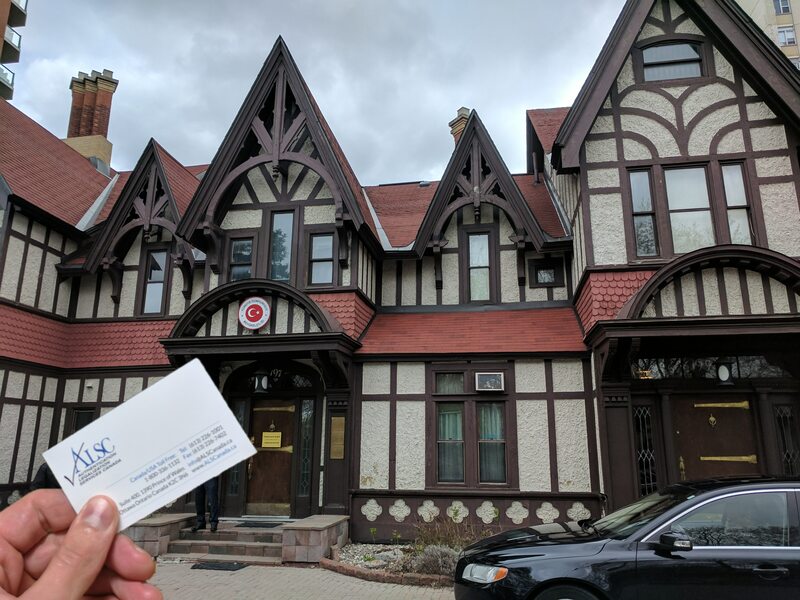 In this case, the consular section of the Embassy of Turkey located here in Ottawa. They have their own requirements as well as fees and processing times to legalize your documents. These can change quite frequently which often makes legalization at the embassy consulate the most difficult step of the process. Delays are very common here and there are numerous factors which can cause them. Once your documents have been legalized, they are now valid for use in Turkey. Unfortunately, by the time this process has been completed it is likely that you have missed your deadline. Potentially waiting over a month to make your documents valid for international use is not an option in many cases. Fortunately, there is an effortless way to expedite this process and minimize the chances of delay at an affordable cost: ALSC. 25 years ago we helped our first client make their Canadian documents valid for international use. Since then we have helped tens of thousands of professionals, law firms, pharmaceutical companies, engineering companies, famous actors, and even former Canadian prime ministers process their certificates of incorporation, articles of incorporation, corporate powers of attorney, birth certificates, marriage certificates, and police checks for use overseas. We are experts in all manner of Canadian documents and are the first company to provide this service. Most importantly, we can save you up to 20 business days off of your processing time with our priority same day authentication service speed. We also offer a 3 business day standard and 10 business day economy authentication service which balance speed with cost to meet your document needs. Although we cannot influence the processing time for legalization at foreign consulates, the professional relationships we have built with consular staff at dozens of embassies across Canada has allowed us to be up to date on their changing requirements and fees, in some cases even before these changes go into effect. As trusted agents, we are the preferred clients of almost every embassy in Ottawa and many more across Canada; we always present your documents correctly for legalization. When you choose our team, our agents will assist you in gathering the appropriate requirements for authentication and legalization of your documents. Once we have received your documents and requirements at our head office for processing, you will receive detailed updates at every step and have your own personal agent to answer your questions and address your concerns. Upon completion we can send your documents anywhere in the world they need to go via FedEx or any one of our other trusted shipping carriers. Our service guarantee means that we ensure your Canadian documents will be valid for use in your country of choice. If you are rushing to meet a corporate deadline in Turkey, we recommend you contact us at your earliest convenience. Continue reading for more information about Canadian documents for use in Turkey. If you are a Canadian business looking to address your affairs in Turkey, you have probably been asked to provide documents such as a Canadian corporate power of attorney, certificate of incorporation, articles of incorporation, or board resolution for use in Turkey. As an existing company, you probably already have many of these documents in an accessible location or know how to get them. The exact documents you will require will depend entirely on your purposes in Turkey and more specifically the requirements of your affiliates or requesting parties in Turkey. Make sure you clarify exactly which Canadian corporate documents you will require for use in Turkey before you begin the process to minimize delays and costs. Once you have done this, your Canadian corporate documents will need to be notarized by a Canadian lawyer or notary public to be valid for authentication at Global Affairs Canada. If you have already completed this step, take a minute to check that the stamp, seal, and signature on your document match, and that the name of the signatory is visible and legible. If they do not match or if the name of the signatory cannot be discerned, Global Affairs Canada will not be able to authenticate your corporate document. There are some cases where it is a good idea to make a notarized copy of your corporate documents instead of using the originals. Since there is a risk of damage or loss during the process, corporate documents which are very valuable or difficult to have reissued should have notarized copies made for processing. With over two decades of work with corporate documents for use in Turkey, we recommend you contact us if you have any questions. Canadian vital statistics documents such as birth certificates, marriage certificates, and death certificates are some of the most commonly requested documents for personal foreign affairs in Turkey. These can be requested from you for a variety of reasons relating to citizenship, employment, marriage, divorce, or inheritance and other estate matters. Canadian vital statistics documents are some of the easiest to process for international use. This is because they come issued with signatures that are recognized by Global Affairs Canada which makes them valid for authentication in their original state and do not require notarization by a lawyer or notary public. Notarized copies can be made of these documents but are not recommended since they are often more expensive than simply ordering a new original from the appropriate vital statistics office. Originals are also often preferred by requesting parties in Turkey and other countries. Note that all vital statistics documents must be ordered from the vital statistics office in which the life event occurred. Marriage certificates from the church and death certificates from the funeral home are not valid for authentication even if they have been notarized by a Canadian lawyer or notary public. Finally, it is always best to get the long form versions of these documents wherever applicable. This usually applies to birth certificates, the long form of which can be referred to as a copy of an act of birth or a registration of live birth depending on the issuing province. Short form versions of vital statistics documents such as wallet sized birth certificates cannot be authenticated. If you need to order your Canadian birth certificate, marriage certificate, or death certificate for use in Turkey, keep these things in mind. Also remember that you can have your document sent directly to our office to save you processing time as many of our clients choose to do. Order your new Canadian vital statistics document using the links below! Authentication and legalization is difficult to do without assistance. This is true even if you are familiar with the process or have gone through it before. This is because the requirements and fees change overtime, meaning it is rare that you will go through the exact same process the next time you go through it. Keeping up with these changing elements and the many details involved is a job in itself. The amount of time required to get your document authenticated and legalized on your own is simply not worth the money in many cases. In our busy modern world, there is lots of other work to be done and there comes a point where it makes more sense to hire the experts than to stumble and fail on your own. Authentication and legalization is one of these points. This is why every year thousands of Canadians choose us and dozens of 5 star reviews on Facebook and Google, an A+ rating with the BBB, and our proud membership with the Canadian Chamber of Commerce are proof that we are the best option when it comes to your international document needs. If you are currently located in Canada, as our client you can receive free shipping via FedEx to our headquarters in Ottawa for processing when you use one of our service centers in Calgary, North York, Mississauga, Halifax, Edmonton, Victoria, Vancouver, Surrey, Regina, Winnipeg, Toronto, or Montreal. You will even receive free shipping back to any one of our service centers for pickup when your documents have been completed. Alternatively, we can ship them elsewhere at an additional charge. Getting your Canadian documents ready for use overseas can be very stressful and time consuming, but it doesn’t have to be. 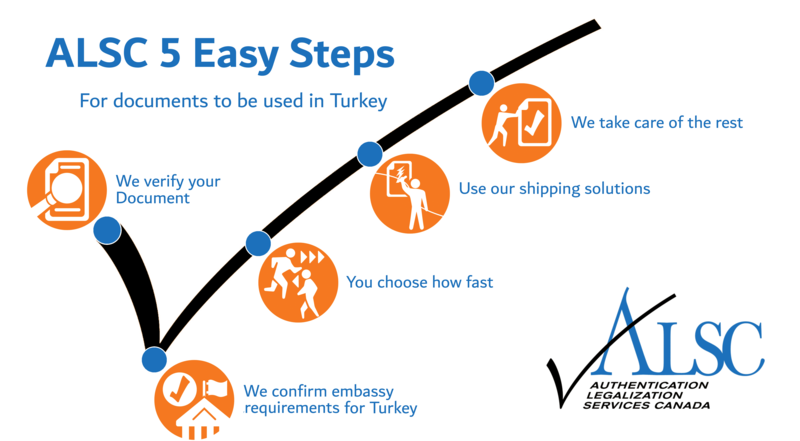 Trust ALSC and see how quickly the experts can make your Canadian documents ready for use in Turkey. Click below to get started!